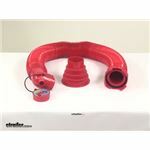 Will the EZ Coupler RV Sewer Hose Fit in 4 Inch Round Storage Pipe? 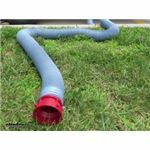 The EZ Coupler RV Sewer Hose Kit w/ Swivel Fitting and 4-in-1 Clear Adapter - 10' Long Hose # D04-0114 is a 3 inch hose that will fit in your 4 inch round storage pipe. 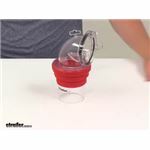 The clear adapter will not fit in the 4 inch storage pipe. 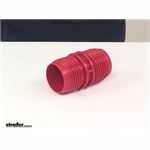 It would need to be stored in a separate location. 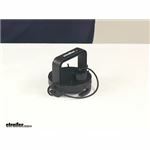 I've attached a video to assist. 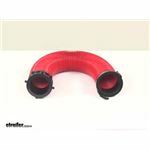 I measured the fittings on the EZ Coupler RV Sewer Hose Kit # D04-0115 for you. 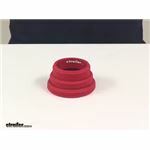 On either end the overall diameter at the widest point is 4.15 to 4.16 inches. 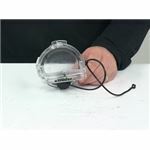 That is a hair under 4-3/16 inches. 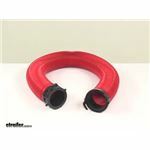 You would want the part # CAM39733 as it comes with the swivel elbow and fitting that you need for your # CAM39761. 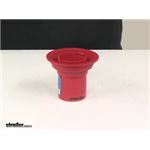 I went out to the warehouse and found that the ID of the EZ Coupler Cap # F02-3106BK measures 3-1/2" while the OD measures 4" as you can see in the attached photo. 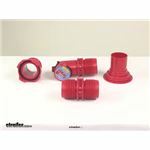 This cap fits the standard 3" waste water valves and comes with a 3/4" gray water tank drain. 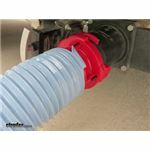 Is More Than one Hose Needed for Connection to Sewer? 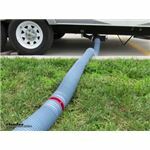 The EZ Coupler RV Sewer Hose Kit # D04-0114 will be all you need in order to drain the black water and gray water tanks at a dump station when at a campground. 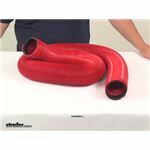 I've included links to a pair of video reviews on this product for you to take a look at. 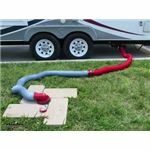 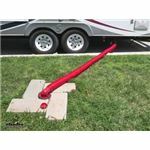 The 90 degree portion of the EZ Coupler RV Sewer Hose Kit # D04-0115 is a separate piece but the part that fits in the dump station inlet is attached to it. 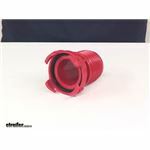 I included a picture showing this close up. 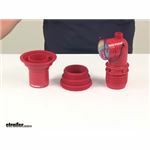 The Replacement Seal for EZ Coupler 90-Degree Bayonet Sewer Fitting # F02-3104VP is approximately 3" and is a replacement for the fitting on the EZ Coupler 4-in-1 Threaded RV Sewer Adapter # F02-3112CL. 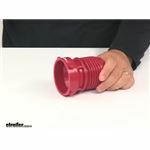 There are differences; the EZ Coupler RV Sewer Hose # D04-0113 is 10' and has both a 3" bayonet fitting and swivel fitting while the Valterra # D04-0111 is 5' and has a pair of 3" bayonet fittings. 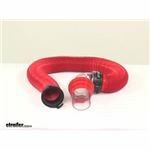 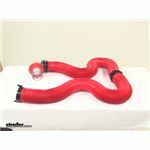 Those hoses do have the same 3" diameter, 18-mil vinyl construction and are red in color. 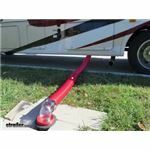 We do not offer a lock made specifically for use on an RV waste valve and we are not aware of any item intended for this specific purpose. 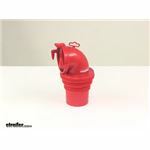 The nearest thing we do offer is the Valterra EZ Valve Electric Waste Valve # E1003VP which operates your dump valve via 12V power. 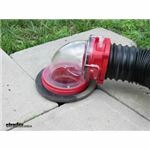 This is not a lock and the valve can still be manually opened but its primary purpose is to allow remote operation of the dump valve. 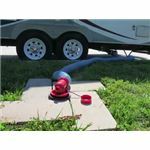 The EZ Coupler 4-in-1 Threaded RV Sewer Adapter with 90-Degree Elbow Fitting # F02-3112CL that you referenced would work well with the Camco RV Sewer Hose Seal # CAM39313. 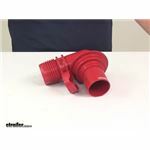 The # F02-3112CL is designed to fit to dump stations much better than standard hoses and when used with the seal # CAM39313 it would provide a much better seal that would not easily work loose like other seals.